Georgia and Florida's back-and-forth battle for first place continues. Week 1 brought us first-place Florida. Week 2, first-place Georgia. Week 3, first-place Florida. And this week, two points give the spelling-challenged Dawgs the nod for No. 1. These teams have essentially been deadlocked the whole season, and unless one gets upset, the argument won't be settled until they meet in Jacksonville on Nov. 1. LSU isn't far behind; Alabama has a ton of ground to make up. 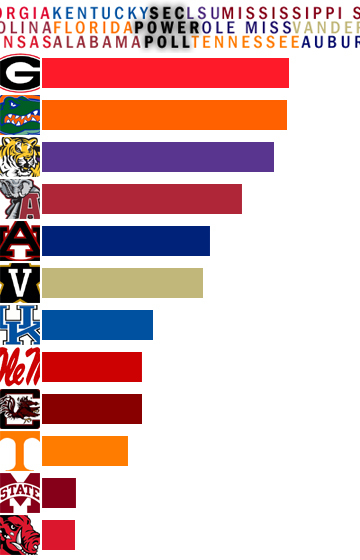 Auburn and Vanderbilt round out the top half. Then comes a yawning 50-point gap before Kentucky comes in. By contrast, only 25 points separate the Wildcats in 7th place and the Volunteers in 10th. And Arkansas has now fallen into possession of the "Worst of the Best" Cup, as Mississippi State's dominated performance against Georgia Tech isn't quite enough to underwhelm Arkansas' self-immolation against Alabama. This race should also go down to the end, as each team looks to one-down the other. Voters expand upon these thoughts after the jump. What does Kige think about all this? We want to know!